You can, under certain circumstances, add counsel to your case service contact list even when that counsel has not opted in to receive eService. Doing so enables you to eServe that counsel. The certain circumstances are: you know the email address for counsel. If this is true, then use the following procedure to add that counsel to your eService Recipients list. This also includes pro se filers. In FileTime we refer to these kinds of service recipient additions as Non-Firm Service Contacts. They are counsel that have been added to a case by you and the eFileTexas system, by design, says that they "belong" to you. Only you will be able to remove that counsel who is not a member of your firm from the case, update his/her email address, etc. Use this procedure to first see if you can add counsel from the eFileTexas Public Service Contact List (PSCL). If he/she is, it is much better to add him/her to your eService Recipients list from the PSCL. 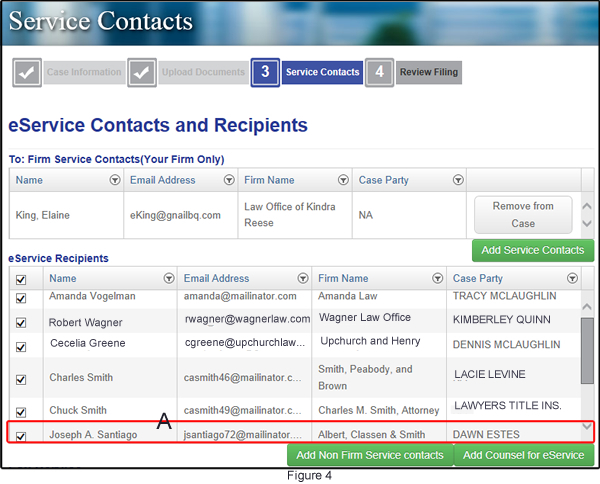 On the eService page of the eFiling Process (Figure 1, A), any counsel already opted in to receive eService for this case are displayed in the eService Recipients section (Figure 1, B). Click the Add Counsel for eService button (Figure 1, C).to search the eFileTexas PSCL to search for counsel to add as a service recipient. 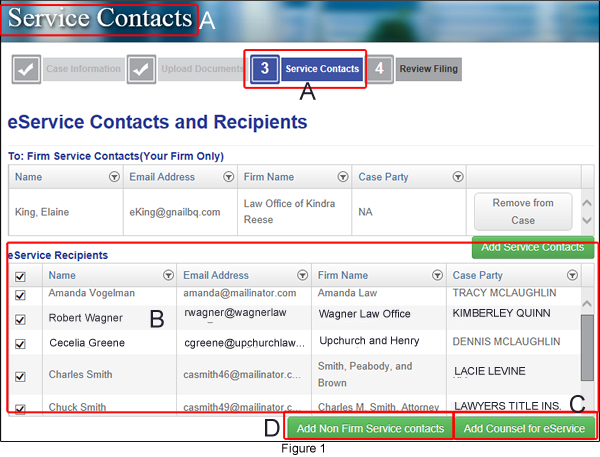 Click the Add Non Firm Service Contacts button (Figure 1, D) to add counsel that you cannot find on the PSCL. After clicking the Add Non-Firm Service contacts button you are taken to the Attach Non Firm Service contacts to this case page (Figure 2). By default you see the Existing Non Firm Service Contacts list (Figure 2, A). This shows you all the non-firm service contacts already added to your general list. To add a new Non Firm Service Contact, click the radio button by the Add New Non-Firm Service Contact area (Figure 2, B). You are taken to the Add Non-Firm Service Contact page (Figurer 3). Enter the name, firm name, and email address for the service contact you intend to add. The firm name is not required. Enter the email address for the new service contact. Remember that all eServices will fail if you enter an incorrect email address. 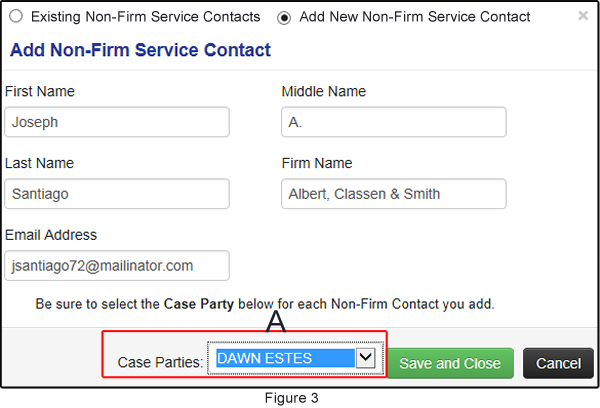 Be sure to select the appropriate Case Party represented by the new service contact you are adding (Figure 3, A). You are returned to the Service Contacts page with the new eService Recipient displayed.